This sample 14 day (13 nights) itinerary covers Rome, Florence, Venice in Italy, The Julian Alps & Ljubljana in Slovenia. The services we provide as part of our comprehensive packages include accommodations, train tickets, transfers (airport & train station as well as long distance transfers from Venice to the Julian Alps and on to Ljubljana) and several city tours. In addition to the tours included we can arrange a number of excursions based on your own interests. Our Destination Manager in the region provides assistance before and during your travels. They will be available to you leading up to the trip to answer any questions and arrange local services. You will be provided with information on the best these destinations have to offer including things to see and do, restaurants, entertainment and other insider tips. Upon arrival we will provide you with a local cell phone that you can use to contact our Destination Manager throughout your trip. In all of our destinations we offer a variety of accommodation options including boutique style hotels, charming B&Bs and spacious apartments ranging from a three to five star level. From our first hand experience we can ensure they are all clean, comfortable and centrally located. We generally discourage chain hotels but provide accommodations with unique features or an authentic feel. After you land at Rome's Fiumicino airport you will be met in the arrivals hall by a driver holding a sign with your name on. The journey to your accommodation in the center of Rome should take around an hour. You'll be introduced to the layout and history of Rome today. Riding in a golf cart through the picturesque cobbled streets of the historical center of Rome flanked by beautifully built aristocratic palazzi, our eyes will be enchanted by the white travertino marble churches and they will feast on the famous variety of colours that make Rome unique. This tour is designed to get you oriented in the city and the main sights in the great center of Rome without duplicating the city's signature attractions such as the Colosseum and Roman Forum and the Vatican. On this tour you'll learn all about Villa Borghese, Piazza di Spagna and the Spanish Steps, the Pantheon, Piazza Farnese and Piazza Navona as well as getting a little outside the obvious and crossing over the Tiber to the Trastevere neighborhood. Rome's origin story unfolds when you visit the Colosseum and the adjacent Roman Forum. Hear about life in ancient Rome and soak in the grandeur of these testaments to a lost civilisation. We can arrange for a private guide to explain how the Colosseum was built and what happened to it in the years since. Afterwards the tour proceeds to the Roman Forum, the center of political life of the city and ultimately the Empire, finding out the different purposes of the buildings whose columns and porticos still stand today. If you'd prefer the atmosphere of a group tour, which for parties of 4 or fewer can also save some money, we can instead arrange for spaces on a tour by a reputable group tour company. Today it's time to bid arriverderci to the Eternal City. You're headed to Italy's art palace, Florence. The high speed train service gets you there in just over an hour and a half. We've included standard class tickets in your package but can upgrade these to business class for an extra fee. We will also arrange for a driver to take you to Roma Termini station in plenty of time for your departing train. The capital of Italy is a vibrant, energetic and stylish city. While thoroughly modern in sensibility, Rome is also home to some of the world’s most important works of classic art and architecture. This city has been an epicenter for culture, politics and religion for more than 2,500 years. From the Spanish Steps to the Vatican, there are more than enough sights to keep even the most active tourists busy and even somewhere as popular as Rome you can find places just off the tourist trail and bustling with locals. But it’s also nice to slow down and enjoy Rome’s famous cafes and restaurants, which can be just as beguiling as the buildings. Lounge with an espresso on the Campo de Fiori and watch the changing light on the fountains and the facades. 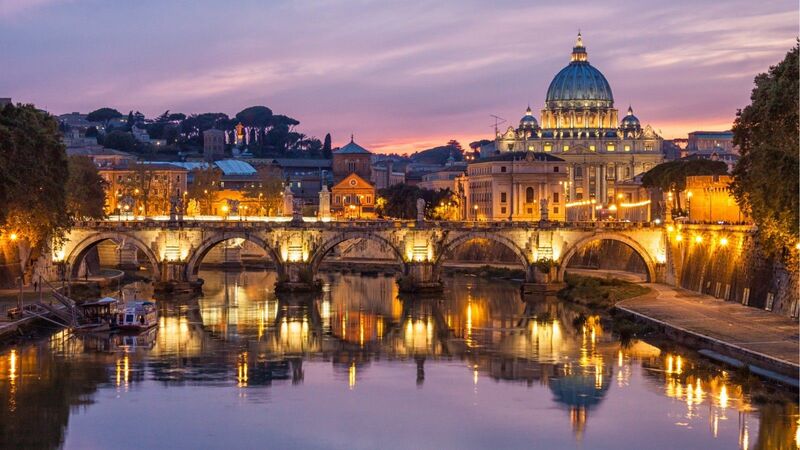 Visit the Vatican and explore some of the world’s most beautiful churches. Rome really comes alive at night, when restaurants and wine bars bring a renewed vitality to the city. You’ll also have opportunities for day trips to local vineyards, olive groves, and other places producing regional delicacies. No matter what your interests, or what kind of holiday you’re looking for, Rome will be an enjoyable destination. Upon arriving to Florence's main station, Santa Maria Novella, we'll arrange for our driver to pick you up from the platform and take you to your centrally located accommodation. This group tour combines visits to the Accademia to see Michaelangelo's famous David, the Uffizi Gallery to admire the must-see works of the Renaissance and a walking tour of the historical center. After the Accademia visit in the morning you'll have a lunch break when you're free to grab a quick bite to eat before rejoining the group for the walking tour and Uffizi visit. Pisa's leaning tower is one of the global icons of Italian beauty and uniqueness. Beside the architectural masterpieces of the Piazza dei Miracoli, Pisa offers a lively experience. This is especially true in the evening along the Arno river embankments, where restaurants and cafes are popular with locals. Another city, Lucca is a hidden treasure of medieval beauty, with one of the best-preserved systems of defensive walls in the world, making it ideal for scenic strolls and cycling. There's also a central square built inside the ancient Roman amphitheatre. Join one of our private or group tours to see just Pisa, or Pisa and Lucca. Your time in Florence has drawn to a close but there's plenty more Italian splendor ahead of you as you push north to the magnificent maritime city of Venice. We have included standard class train tickets for the high speed train service which takes around two hours. We'll arrange for our driver to pick you up from your accommodation and take you to Florence Train Station. Florence is the capital of Tuscany and home to the region’s greatest Renaissance art and architecture. The Renaissance actually started here, and today the city’s numerous cathedrals and art galleries show the evidence of this rich and inspiring period. You’ll want to see the Duomo Cathedral and the Galleria dell’Accademia, which houses Michelangelo’s “David.” Botticelli and Da Vinci are here too, at some of the city’s other amazing galleries. But there’s more to do in Florence than admire art. It’s a beautiful and very romantic place, and even a stroll through the streets is charming. Add a handful of world-class restaurants, delectable local wine and cuisine, and that warm Tuscan welcome, and you have a destination unlike any other. Visiting Florence also perfectly situates you for exploring Tuscany. There are many easy day trips that will take you through picturesque landscapes of hills and vineyards in the heart of Italy. Today you'll be traveling to the lovely Julian Alps. Your driver will pick you up at your accommodation. The trip takes about 3.5 hours but we recommend stopping along the way in Trieste, Postojna or Predjama, which we can arrange for an extra fee. The vehicle used for your transfer will be a standard sedan, station wagon or minivan. We can arrange for an upgrade to a more luxurious class of vehicle for an extra fee. Your driver will bring you straight to your accommodation. The Julian Alps is one of the best destinations for hiking in Europe and that's why we highly recommend going for a hike while you're here. These unspoiled mountains are a breath of fresh air for walkers and mountaineers, who come to enjoy the lush green valleys, crystal-clear rivers and dramatic limestone peaks. Wherever you are in the Julian Alps, it is possible to discover the natural beauties on foot. There are more than 7,000 kilometers of marked trails in the mountains of Slovenia, along which there are 165 mountain lodges, huts and bivouacs. The Julian Alps offer an abundance of both easily accessible trails and more difficult ones, so hikers of all levels can enjoy themselves here. Today you'll be leaving the Julian Alps and heading to lovely Ljubljana. You'll take your time along the way and enjoy some of the beautiful scenery and cities in between. This full-day transfer takes about 9 hours. It includes visits to Bled and Bohinj, both marvellous destinations, as well as stops along the way in Kobarid or Bovec. You can choose the stops with your driver based on your interest, whether you'd like to hike, raft, walk or just relax in nature. The vehicle used for your transfer will be a standard sedan, station wagon or minivan. We can arrange for an upgrade to a more luxurious class of vehicle for an extra fee. For travelers who like spending time in nature, it doesn't really get any better than The Julian Alps. This mountain range in northwestern Slovenia offers a wealth of picture-perfect landscapes, pristine hiking trails, rafting opportunities and much more. It's the perfect destination for a holiday that combines outdoor activities with relaxation. From hiking and swimming to rafting and cycling, there's more than enough to make your stay unforgettable. Besides the natural wonders, some of Slovenia's most notable towns are located in the region, including the beautiful Lake Bled and Lake Bohinj, and the historic Fort Kluze. You will also have ample opportunities to enjoy the local cuisine, which features plenty of freshwater fish. The Edenic beauty of The Julian Alps will charm you, and the local hospitality will allow you to tailor your stay here to your own interests, whether that's conquering mountain peaks, or floating blissfully on one of the many emerald-green lakes and rivers. 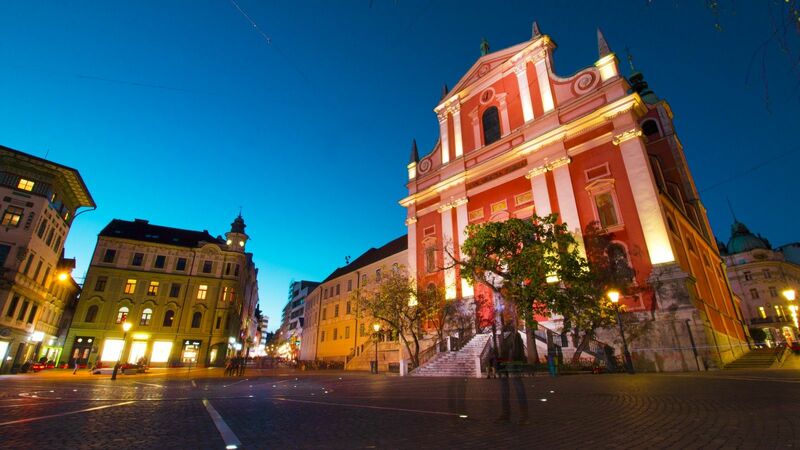 When you arrive in Ljubljana, your driver will take you directly to your accommodation. A driver will pick you up at your accommodation and transfer you to the airport for your departing flight.